Paint the images of Cars 2 in the latest gaming project by DoubleGames! You don\'t just paint the plain depictions from Cars 2 3D animated film! Download Cars 2 Color for free and experience all the odds of the recent game by DoubleGames! Sure thing, you have already heard about the next release of Cars 2 by Walt Disney Pictures, have you? So have DoubleGames. They wish to give our new free project, too! Jeff Gorvette or Siddeley - whom will you paint in our new free download Coloring game? 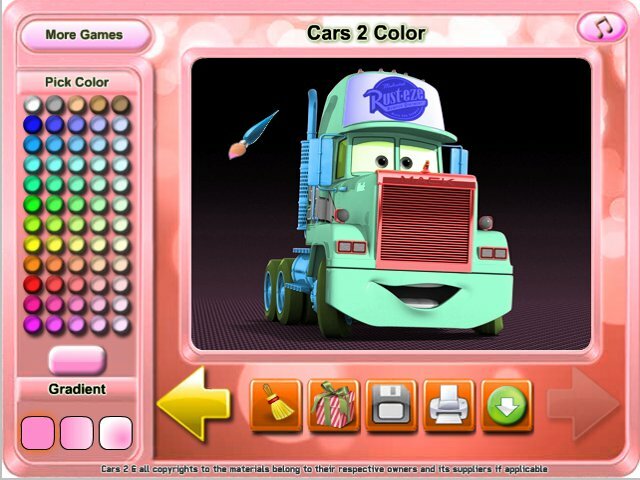 To know it, download Cars 2 Color absolutely for free just now and test the odds of the newest free download project!